If using a flexible silicone mold to set the jello shots, prepare it by spraying lightly with cooking spray. Then wipe out each mold cavity thoroughly with a paper towel. This will leave a very slight residue which will aid in unmolding without affecting the taste or appearance of your jello shots. A glass or non-reactive metal standard 1 lb loaf pan, or two mini loaf pans, may also be used to set the jello shots. No prep needed for a pan. Pour lemonade concentrate and water into a small saucepan. Sprinkle with gelatin and allow to soak for a minute or two. Heat over very low heat, stirring constantly, until gelatin is fully dissolved (approximately 5 minutes). Stir in the vodka. Divide the mixture into two bowls. To one bowl add the sour watermelon liqueur, to the other, the sour apple liqueur. Pour into mixtures into pan or molds and chill until fully set, several hours or overnight. To serve, unmold (or if the jello shots are set in a pan, cut into desired shapes). 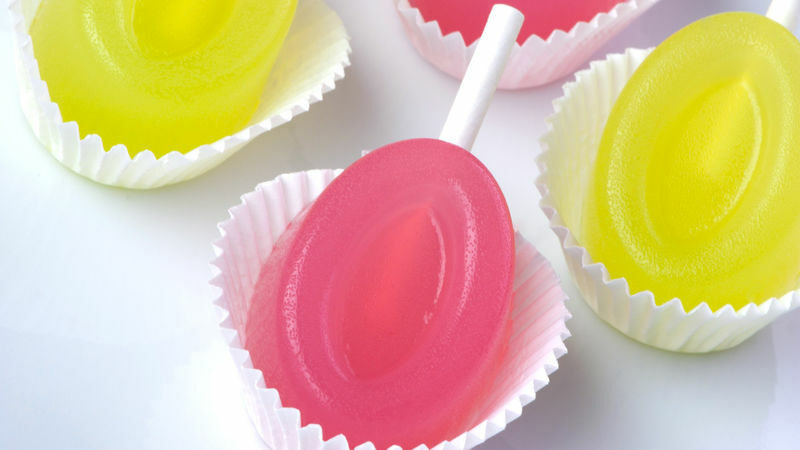 Cut the lollipop sticks into approximately 1 1/2 inch segments. Immediately before serving, insert into each jello shot and place each jello shot in a mini cupcake wrapper. Nostalgic, candy-themed cocktails have been popping up all over – on restaurant and bar menus, and all over the web. High time for a little jelly shot experimentation! Blow Pop Martini Jelly Shots have it all - a little sweet yet tart (from the lemonade and the sour fruit liqueur), with a lingering bubble gum note (from the bubble gum vodka) running through. For me, this is an improvement on the original lollipop (so much work to get to the bubble gum in the center - the best part!). Given my fondness for bubble gum vodka, it pains me to say this, but should you have difficulty finding it, this recipe could be made with plain vodka or fruit-flavored vodka. I used green apple and watermelon sour fruit flavored liqueurs to flavor the jelly shots. The liqueurs come in many other “sour” flavors: berry, peach and grape, to name a few. A flexible silicone mold was used to set the jelly shots. You could also use a flexible silicone mini muffin pan – these are available in most kitchen shops, or set the jelly shots in a standard 1 lb loaf pan (glass or non-reactive). Bring these cute shots to your next gathering and everyone will love the nostalgic (and tasty) vibe these Jello shots will bring to the party.